Many torture survivors do not speak English as their first language, and it might be necessary to have an interpreter be part of sessions with that survivor. Interpreters take the spoken word in one language and change it into the spoken word in a second language. (Note that a translator takes the written word in one language and changes it into the written word in a second language.) The materials on this page pertain to interpreters. Most health-related sessions are interpreted consecutively, meaning the interpreter speaks after the provider or the survivor finishes. This PowerPoint was developed by the Program for Survivors of Torture for use in training interpreters, and may be useful to you in creating your own introductory materials for interpreters. These three glossaries (dental, intake, and psychotherapy) were created by the Program for Survivors of Torture to help interpreters make sure they are prepared for different types of interpreting. The International Medical Interpreters Association has a good page on terminology, as well as other resources. It also has a document on the IMIA standards of practice: These standards of practice developed by the IMIA were developed in 1996 and updated in 2007. This document outlines the role of an interpreter in a clinical setting and provides standards of practice on interpretation, cultural competency, and ethics. Additionally the document contains an evaluation tool. 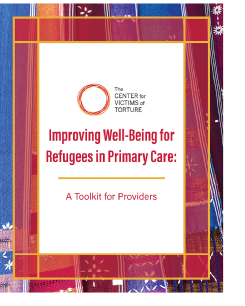 This document can be used in the development of a training program for interpreters, as an evaluation tool, and in preparing health care providers to work with interpreters. The Cross Cultural Health Care Program offers training for medical interpreters in many locations, and a variety of publications for purchase. Communicating Effectively Through an Interpreter. From the Cross Cultural Health Care Program, this excellent 28-minute video is available for $150. Miller, K. (2004). Beyond the frontstage: Trust, access, and the relational context in research with refugee communities. American Journal of Community Psychology, 33, 217–227. Tribe, R. (1999). Bridging the gap or damming the flow? Some observations on using interpreters/bicultural workers when working with refugee clients, many of whom have been tortured. British Journal of Medical Psychology, 72, 567–576. Read more about Bridging the gap or damming the flow? Kaufert, J. & Putsch, R. (1997) Communication Through Interpreters in Healthcare: Ethical Dilemmas Arising from Differences in Class, Culture, Language and Power. Journal of Clinical Ethics 8, (1), 71-87. Gunther, M. (1994). Counter-transference Issues in Staff Caregivers who Work to Rehabilitate Catastrophic-Injury Survivors. American Journal of Psychotherapy, 48, (2), 208-220. Duffy, K. & Veltri, D. (1998). Interpreting in Therapy: Getting Out of the Way.VIEWS, 15 (4). Angelelli, C. V. (2004). Medical Interpreting and Cross-Cultural Communication. Cambridge: Cambridge University Press. Link is to book on Google Books; available for free but some pages are omitted. Scant attention has been given to the emotional plight, lack of training, and stressful working conditions of interpreters serving survivors of severe human-perpetrated trauma from different parts of the world. This article addresses the critical need for effective collaboration between social workers and interpreters when the provider and survivor do not speak the same language.